Scores of volunteers at the California Genealogical Society work in the background to keep the library humming along. Whether they are shelving books, cataloging periodicals, opening mail, paying bills, maintaining computers or performing umpteen other tasks, members selflessly contribute their time to the overall running of the society. Usually CGS volunteers do their work behind the scenes, without fanfare or public acknowledgment. But occasionally members step forward to significantly contribute to a published work that warrants placing their name on the cover of a book. If you scroll down the right sidebar of this blog you will see some of the publications edited by Barbara Close. Barbara Ross Close directed the indexing of several society projects, including the San Francisco I.O.O.F. Crematory records, the S.F. Death series and the California Surname Index. Each work represents time spent by a team of members, gathering up raw data held by CGS, then writing and sorting it – imposing order by printing, proofing, formatting, finishing, publishing, marketing and distributing it along the way. Thousands of volunteer hours are the underlying reality of the CGS publication list. In addition to her contribution supervising specific indexing projects, Barbara also served as chair of the Publications Committee for the last three years. Barbara is well-trained for her tasks at CGS. She holds a B.A. in English from University of California, Berkeley and has a Masters in Library Science from San Jose State. The twin skills of patience and perseverance required for indexing were honed during a career in education in Oakland, where Barbara taught grades four through nine, and was a school librarian. 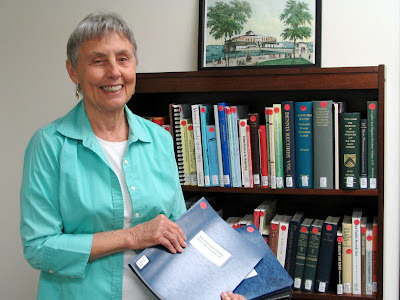 Close has been a member of the California Genealogical Society since 1991. She was first introduced to the society by past-president, Rick Sherman, who shares another passion with her – folk dancing. (I'll have to blog sometime about the large number of CGS members who are involved in all manner of dance pursuits!) Barbara's interest in genealogy dates back to a conversation with her uncle just after her father's funeral in Redding, California. She realized that she knew almost about her father's family and the search began. Barbara recently stepped down as chair of the Publications Committee. Thanks, Barbara, for all of your exceptional work.